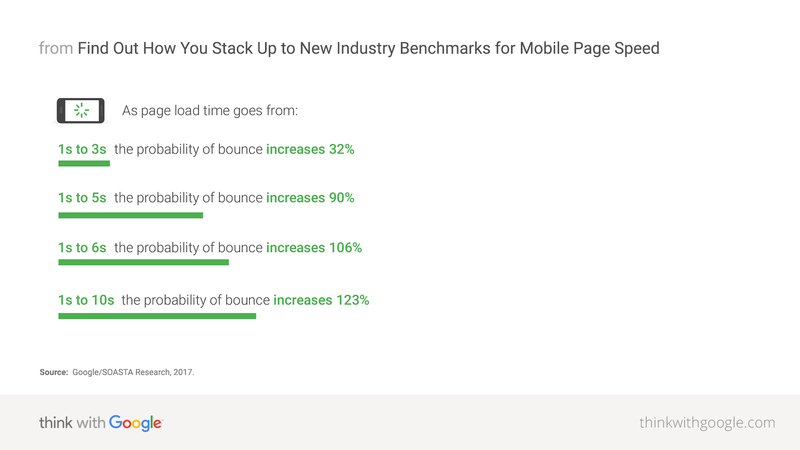 The average time it takes to fully load a mobile landing page is 22 seconds, according to a new analysis.1Yet 53% of visits are abandoned if a mobile site takes longer than three seconds to load.2That's a big problem. It's no secret that shoppers expect a fast mobile experience. If there's too much friction, they'll abandon their cart and move on. Today, it's critical that marketers design fast web experiences across all industry sectors. Consumers want to quickly pay bills on finance sites, get rapid results when they're browsing holiday reviews, and view an article immediately when they click through. Despite the fact that more than half of overall web traffic comes from mobile,3 our data shows that mobile conversion rates are lower than desktop.4 In short, mobile page speed equals revenue. 4 Google Data, aggregated, anonymized data from Google Analytics for U.S. retailers, Apr. 2016. 7 DoubleClick by Google, "The Need for Speed: How Latency Impacts Publisher Revenue," Sept. 2016.